BBX, BBM... what next? BBE and BBN? 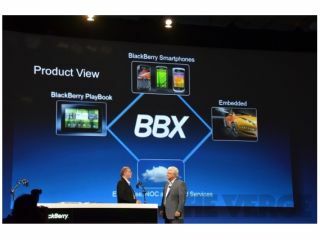 RIM has announced BBX, its next-generation software platform for smartphones and tablets. It's basically the QNX operating system that first launched on the BlackBerry PlayBook last year, but it will work on the company's smartphones, tablets and what RIM is calling "embedded devices" – like car dashboards and smart TVs. Co-CEO Mike Lazarides took to the stage at the company's annual Developers Conference (that's DevCon, to those in the know) to unveil BBX, detailing the new software's security credentials and power-management know-how. Dan Dodge, who founded QNX, has also spoken onstage about BlackBerry's commitment to "real-time multi-core performance", hinting at the multi-core superphones that RIM has to come. RIM also showed off some new user elements, like the Cascades HMI Engine that has been designed by The Astonishing Tribe, with 3D interfaces and powerful game engines galore. The keynote is continuing as we speak, but as yet there haven't been any actual hardware announcements. Stay tuned for more.